Fans of CW’s Supernatural – the hit show starring Jared Padalecki and Jensen Ackles – have been busy lately fundraising for charity. Fans of the show are currently collecting rubber ducks for a brand new charity campaign which aims to raise money for the stars’ favorite charities. 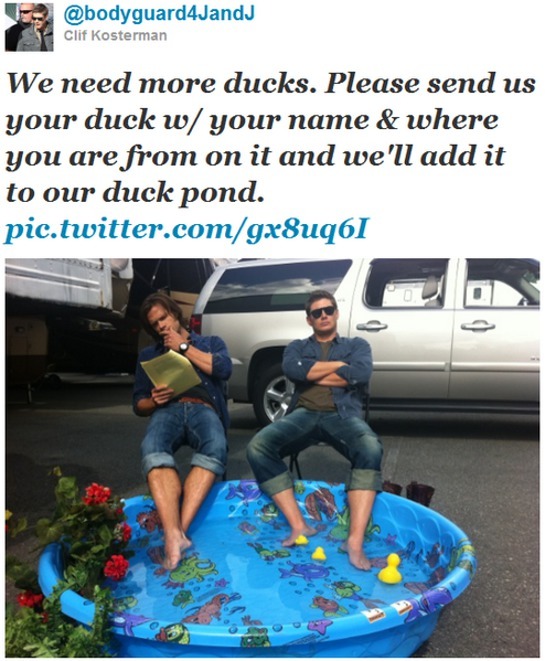 Earlier last week, Clif Kosterman – a crew member of the hit show – tweeted that they wanted fans to send in rubber duckies to join Jared and Jensen in their pool. He asked that fans write their name and country on the ducks, and that the first duck from each continent would get a prize. Clif added that they would donate the ducks to different charities and then auction off some special ones that Jared and Jensen chose for charity as well. The first ducks arrived within hours of the tweet, and pictures were tweeted by Clif. Within 3 days 198 ducks had arrived. Ducks can also be brought to the Salute to Supernatural Vancouver 2011 by August 28. That’s not all the cast, crew and fans of Supernatural are doing for charity. From March 1, 2011 through December 31, 2011, Supernatural fans and animal lovers are being asked to donate to A Dog's Life Rescue. 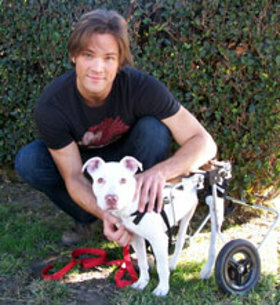 Jared is pictured here with Mika, one of the group’s special rescued dogs. Mika was found in an alley at just two weeks of age by a young man walking home from school. The boy’s mom contacted A Dog’s Life Rescue for help because Mika is a special needs puppy. Mika is paralyzed from the waist down. Mika has no idea she is different from other dogs. She gets around on her own and is so full of life and love. She is absolutely inspiring. Mika is just one of hundreds of amazing rescued animals that A Dog’s Life Rescue has saved. A Dog’s Life Rescue is unlike any other animal welfare organization. They help dogs, cats, birds, you name it! Find out how you can help here. WinchesterBros.com is also running a charity campaign for the American Cancer Society, in honor of director Kim Manners, who passed away in 2009. From August 1 until September 23, the site will be raising money for this important charity. All day on September 23, they will be randomly drawing names from all of those who have donated at least $10, and the winners will win awesome Supernatural prizes. Find out how to take part here.